For more information, see How to View Project Properties. Apply read-only security. When selected, this property prohibits modification or deletion of a project. A project with read-only security displays a lock next to it in the Explorer. When a project is in read-only mode, new files cannot be created, since an entry needs to be made in the .gfa file. A message will be presented to the developer. Modify directory paths. The Related Directories list contains directories in the project path. A project searches the directory paths in the order they appear on the list. You can add or remove a path, or change the search order. 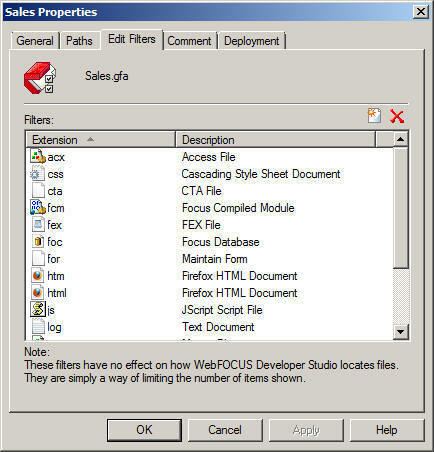 Each project can have a unique search path that is independent from the search path set on the WebFOCUS Reporting Server. Customize the display of items (file types) in a folder. You can modify the file types that display in a folder in the Explorer. Add a comment. You can add a descriptive comment about a project. Select a deployment scenario. A deployment scenario defines the partitioning of the files and the selection of servers. For example, you might have two deployment scenarios for a project, one that maps the files to a production server and one that maps the files to a test server. You can associate a specific deployment scenario with a project. Select a starting object. You can flag an object to run first when a project is started. 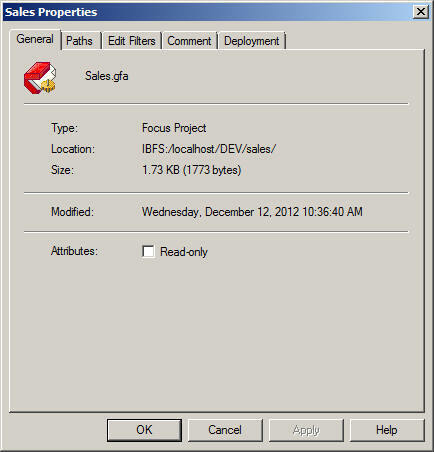 You can also view project properties, such as file type, location, size, and date of last modification. Right-click a project and then click Properties. 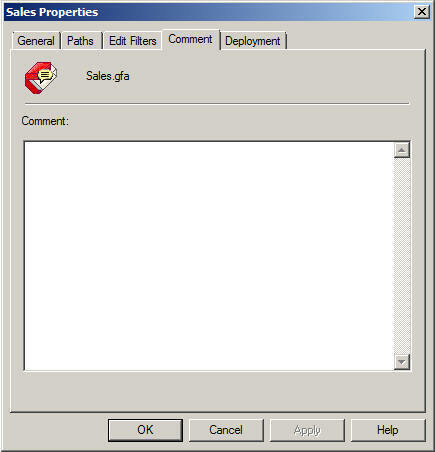 The properties dialog box opens, displaying the General, Paths, Edit Filters, Comment, and Deployment tabs. The General tab is selected by default. It displays the project type, location, size, and date of last modification. You can modify certain project properties using this dialog box. On the General tab, click the Read-only check box. Complete the dialog box as described in this topic. Click OK to apply changes and close the dialog box, or click Apply to temporarily apply changes and keep the dialog box open. Click Close to apply the temporary changes. Right-click a project and select Properties. 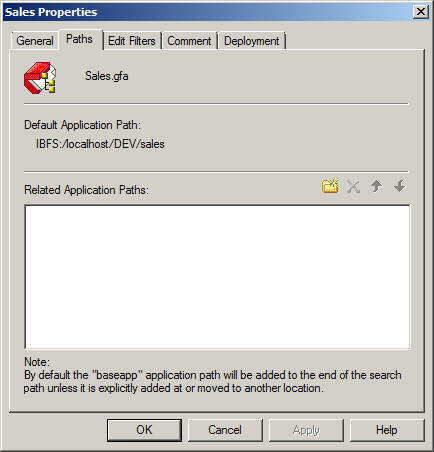 Click the Paths tab, as shown in the following image. To add a new directory path, click the Add new directory button . Select from the available folders and click OK. The new directory is added to the Related Directories list. To remove a directory path, highlight it and click the Remove directory button . Click Yes to confirm the deletion. To reposition a directory path, highlight it and click the Move Directory Up or Move Directory Down button . These buttons are inactive for a single directory. Right-click a project and choose Properties. Click the Edit Filters tab, as shown in the following image. To add an item, click the Add new file type filters button . The New Filter dialog box opens listing the file types registered with the operating system. Select a registered file type and click OK.
To remove an item, highlight it and click the Remove file type filters button . Click Yes to confirm the deletion. Click the Comment tab, as shown in the following image. Place the cursor in the Comment field, and type your comment. The comment displays as a ToolTip when you hover over the project name in the Explorer. The same applies to the virtual folders. 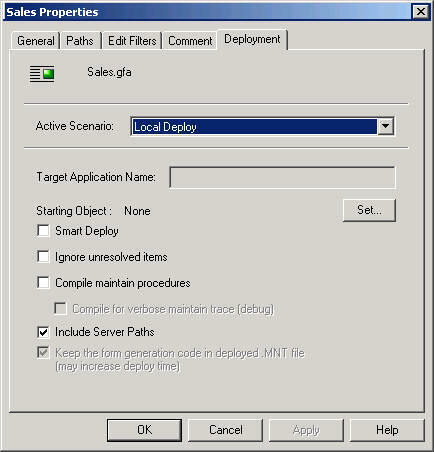 Select the Deployment tab, as shown in the following image. On the Deployment tab, click the Active Scenario drop-down list, and select a scenario. 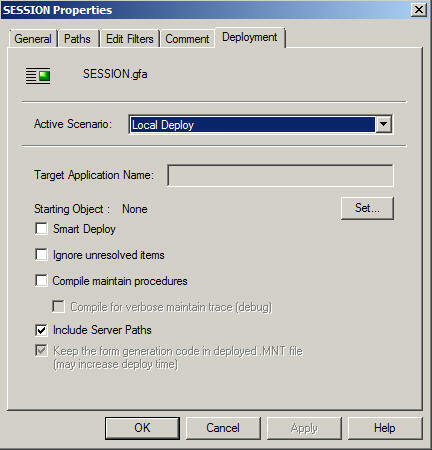 The list contains all the scenarios created using the New Scenario option of the Deploy feature, and the default scenario (Local Deploy). If you select a scenario other than the default scenario (Local Deploy), the Target Application Name field is enabled. This displays the application name to be created in the target deploy environment, or you can enter a new application name that will be used on the web server and WebFOCUS Reporting Server deployment paths. Click the Set button to open the Set Starting Object dialog box and make your selection. Typically, the starting object for a deployed application is an HTML file. The dialog box contains all the valid starting objects created for this project. In the Explorer, the icon for a starting object shows a down arrow, indicating that it will run first. For details about deployment, see Partitioning and Deploying Project Files. Is the type of project. Developer Studio supplies this value. Is the path in which the project and its associated files reside. Developer Studio supplies this value. Is the size of the project in bytes. Developer Studio supplies this value. Is the date and time the project was last changed. Developer Studio supplies this value. Read-only prohibits modification to or deletion of a project. Confirms changes and returns to the Explorer. Aborts changes and returns to the Explorer. Temporarily applies changes and keeps the dialog box open. Click Close to apply them permanently. Are the directories in the project path. Developer Studio searches the directories in the order in which they appear on the list. Use the Add New Directory, Remove Directory, Move Directory Up, and Move Directory Down buttons to modify directory paths. Adds a directory to the project search path. Deletes a directory from the project search path. Moves a directory up in the project search path. Moves a directory down in the project search path. Are the file types associated with a project. 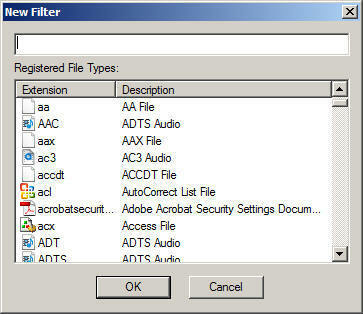 Use the Add New File Type Filter(s) and Remove File Type Filter(s) buttons to modify the Filters list. Type a descriptive comment for the project in the Comment field. Indicates how to partition the files. Select from the available scenarios in the drop-down list. If you select a scenario other than the default scenario (Local Deploy), this field is enabled. Otherwise, this field is disabled. Optionally, enter an application name that will be used on the web server and WebFOCUS Reporting Server deployment paths, or accept the default value (the current project name). If you are deploying files to your development server, you must provide a target application name other than your development directory. Indicates the first component that runs. For a deployed application, the starting object is typically an HTML file. Select from the available objects in the drop-down list. Deploys only the files that have changed since the last time you deployed the application. This option can significantly increase the speed of deployment. A file that once belonged to the project but was deleted outside of Developer Studio. A file from another project in which it was shared. A file located in a directory that changed and can no longer be found. Compiles Maintain procedures during deployment. Compilation improves application performance. For more information, see the Developing WebFOCUS Maintain Applications manual. Reserved for debugging purposes. It can affect performance. For more information, see the Developing WebFOCUS Maintain Applications manual. Allows the deployment process to include server paths in the Call and Exec statements within Maintain procedures. Keep the form generation code in deployed .MNT file. Deploys .MNT files with any original form code intact. This option is enabled by default. A decrease in the speed of deployment may be noticed if a project contains many forms. Select a file type from those registered with the operating system, and click OK to add it to the Filters list on the Edit Filters tab. Confirms changes and returns to the properties dialog box. Aborts changes and returns to the properties dialog box.